Ftiotida, Lamia, Thermopiles, Central Greece, Greek Restaurant, Tavernas, Shopping in Greece. 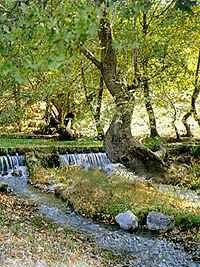 Fthiotida with mountains, valleys, rivers, numerous medicinal springs, woodland, and sandy beaches. 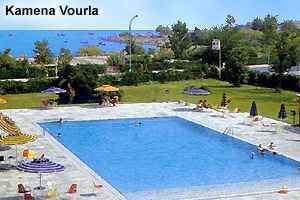 There are some excellent beaches at Kamena Vourla, one of the best-known and most frequented spas. Skala also has fine bathing beaches and, west of Lamia. Winter sports enthusiasts should visit the Mount Parnasos Winter Sports Resort, 27km (17 miles) from Arachova and 17km (11 miles) from Amfiklia. The GNTO installations are located at Fterolaka and at Kelaria, at an altitude of 1600-2250m (5250-7380ft). The center is open daily from December to April between 09.00-16.00. In Gerondovrachos, at an altitude of 1800m (5910ft) on Mount Parnasos, there is a ski center run by the Athenian Ski Club. Other coastal resorts include Agios Konstantinos, Arkitsa and Livanates. Lamia: the capital (41,000 inhabits. ), is a busy provincial capital and an important transport junction, so you might have to stay here if you miss a connection. All buses – including the service from the train station (6 km out) – arrive in the southeast quarter of the town, and most of the hotels are nearby. Thermopyles: After swinging down from the mountains north of Delphi, is the site of Thermopyles on the main highway from Thebes to Lamia. There is a monument of Leonidas and further up the mountain is the site where he made his famous stand against the Persians.